It is a little too easy to say that this outbreak of higher health spending is just due to Obamacare. To be sure, Obamacare has increased health spending with only marginal improvement in access to care. However, the population is aging, too; and the actuaries also take account the positive relationship between economic growth and health spending. The actuaries expect the economy to be relatively strong over the next decade, and estimate the rate of growth of health spending will exceed the rate of growth of Gross Domestic Product by only 1.1 percent. This is less excessive than in most recent decades. Yet, it is still excessive, and a change for the worse. One reason is “over insurance.” American patients still do not control enough of our health spending directly to have an impact on national health expenditures. You do not have to go far to find higher deductibles and co-pays identified as an important factor controlling health spending over the last few years. There is evidence that allowing patients to control more health dollars directly reduces costs and does not harm most patients. Further, Americans are increasingly accustomed to using tools that make such spending tax-advantaged, such as Health Savings Accounts, Health Reimbursement Arrangements, and Flexible Spending Accounts. This has led to increased adoption of consumer-driven plans in the employer-based market. A 2014 survey by Mercer, a firm of consulting actuaries, declared “Modest health benefit cost growth continues as consumerism kicks into high gear.” The survey found average found enrollment in high-deductible, consumer-directed health plans had reached 23 percent of all covered employees in 2013; and that nearly half of large employers offered a consumer-driven health plan. Remarkably, plans that are eligible to be paired with Health Savings Accounts are widely available in Obamacare’s exchanges. However, despite their successes, consumer-driven plans have not increased the share of health spending controlled directly by patients. Nor will they in the next decade, according to the actuaries. U.S. health care will continue to suffer from a crisis over insurance. 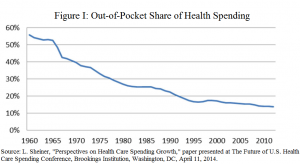 As shown in Figure I (from Louise Sheiner of the Brookings Institution), out-of-pocket spending as a share of health spending declined from well over 50 percent in 1960 down to below 20 percent by 1990 and has kept dropping since.